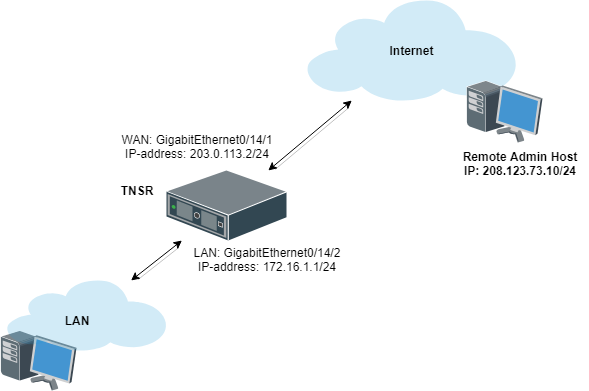 A typical use case for TNSR is a device that sits between a local area network (LAN) in an office or home and a wide area network (WAN) such as the Internet. DHCP to provide hosts in the LAN with IP addresses. NAT (Network Address Translation), to map one public IPv4 address to internal (private) IP addresses assigned to hosts on the LAN. The above example configures example.com as the domain name supplied to all clients. For the specific subnet in the example, the TNSR IP address inside the subnet is supplied by DHCP as the default gateway for clients, and DHCP will instruct clients to use the DNS Resolver daemon on TNSR at 172.16.1.1 for DNS. This example enables the Unbound DNS service and configures it to listen on localhost as well as 172.16.1.1 (GigabitEthernet0/14/2, labeled LAN in the example). The example also allows clients inside that subnet, 172.16.1.0/24, to perform DNS queries and receive responses. It will send all DNS queries to the upstream DNS servers 8.8.8.8 and 8.8.4.4. No configuration is necessary on the Local PC, it will pull all its required settings from DHCP.